This package can perform automatic generation of PHP classes from MySQL tables. It is able to access to a given MySQL database and retrieve schema tables and fields. For each table it generates a class that provides methods for accessing, reading and writing its records by using object oriented programming logic. Each generated PHP class provides Setter and Getter methods for all table fields, as well as methods for CRUD operations. How to find package ? I'd like find package for accessing MySQL database. What MySQL wrapper should I go with? How to convert mysql code to use mysqli? The utility generates automatically PHP classes for any tables of a given database schema. Package is extracted from my personal PHP Web MVC Framework. 1) Set your database by modifying mysqlreflection.config.php file. 2) Then just run app_create_beans.php to launch utility GUI. (Note: GUI uses Bootstrap and jQuery from CDN. So you must have internet connection alive) 3) Click "Generate Classes" button. After running the utility you will find all generated classes into "beans" folder. Auto generated classes are prefixed with "Bean". 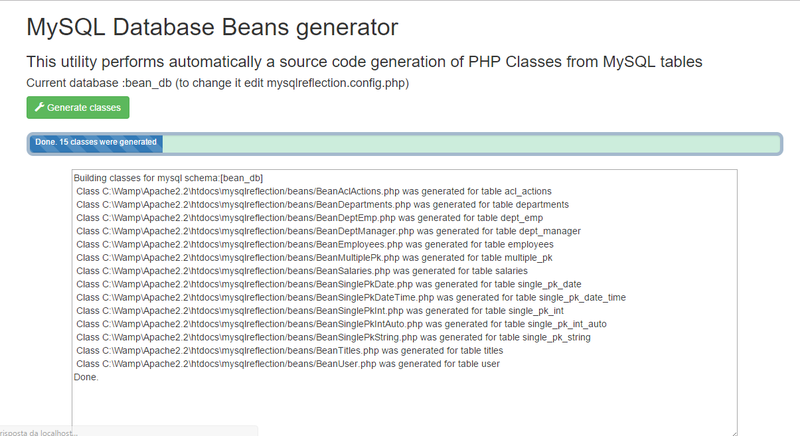 Each auto generated class uses bean\bean.config.php for configuration info. 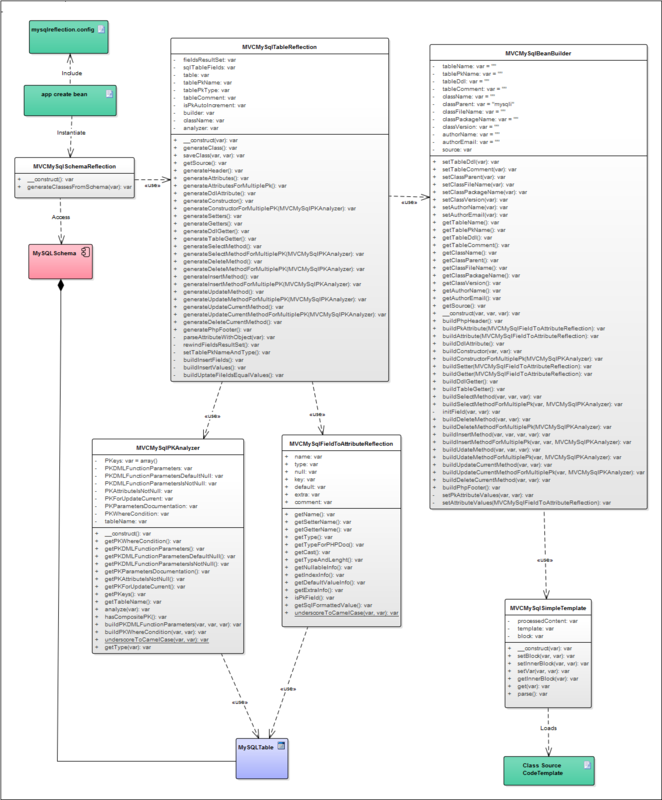 Useful PHPDOC information about table, fields and the usage of class, attributes and methods. Developers can quickly use these classes on their application. Into the beans directory are located some auto generated classes of a MySQL schema. 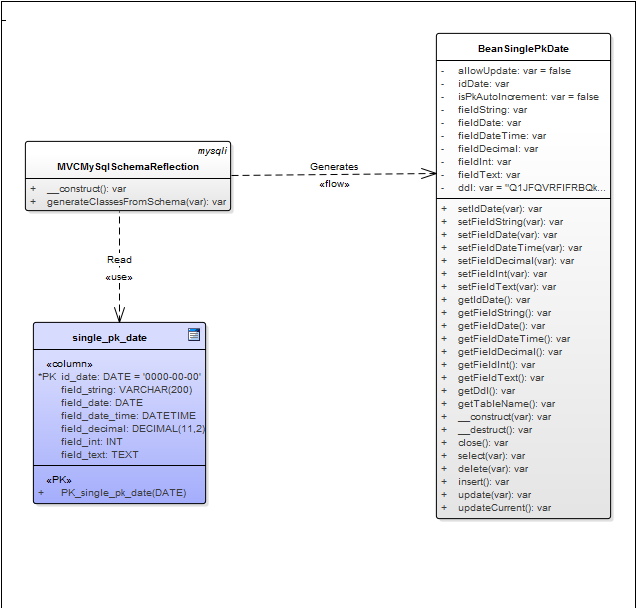 DDL for MySQL schema is into a script file located into "sql" directory. There is also a simple tester script "app_run_bean.php" for showing usage of a generated class. Very useful to autogenerate PHP classes from MySQL.